Justinian I (Latin: Flavius Petrus Sabbatius Iustinianus, Greek: Ιουστινιανός; May 11, 483 C.E. – November 13, 565 C.E.) was Eastern Roman emperor from August 1, 527 until his death. One of the most important rulers of late antiquity, he is best remembered for his reform of the legal code through the commission of Tribonian, the military expansion of imperial territory that was achieved during his reign, primarily through the campaigns of Belisarius, his building activities, and his marriage and partnership with his wife Empress Theodora. He also built defensive walls along the eastern and southeastern frontiers of the empire. Justinian is known as "The last Roman emperor" and was the emperor who reconquered the city of Rome from the Ostrogoths. He is considered a saint in the Eastern Orthodox Church, commemorated on November 14. He was a staunch supporter of the Christianity as the state religion, instigating persecution of heretics, pagans and introducing anti-Jewish measures, even forbidding the use of Hebrew. Apostasy from Christianity was punishable by death. Heretics were those who departed from the Creed of Chalcedon (451). He is said, though, to have had a tendency towards Monophysite sympathies; his wife was a Monophysite and she is said to have exercised much influence over his policies and administration and who appears to have given wise counsel. Justinian saw himself as the new Constantine. He set out to restore and to revive the glory of the Roman Empire, especially its unity. It is difficult to ascertain whether he was a man of deep personal religious faith or whether religion served only a policing function to help unite his empire. On the one hand, he taxed heavily; on the other, he gave generously when any natural catastrophe or calamity occurred. He also built monasteries, orphanages, hostels, the Hagia Sophia in Constantinople, as well as many public buildings such as aqueducts and bridges. Born Flavius Petrus Sabbatius in a small village called Tauresium in Dardania (identified either near modern Skopje, Macedonia, or with Caričin grad, Serbia), probably on May 11, 483. As he admitted himself, he was born into a peasant family, having Latin as his "ancestral tongue," and was by no means a Slav, as Slavophile traditions of much later date affirm. His mother was Vigilantia, the sister of the highly esteemed General Justin, who rose from the ranks of the army to become emperor. His uncle adopted him and ensured the boy's education. 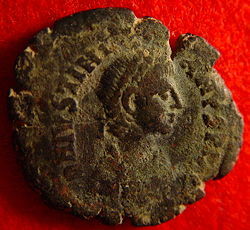 As a result, the young Petrus Sabbatius took the cognomen "Justinianus" to indicate his adoption by his uncle. Superbly educated in jurisprudence, theology and Roman history, and with his military career featuring rapid advancement, a great future opened up for him when, in 518, Justin became emperor. Justinian was appointed consul in 521, and later as commander of the army of the east. He was functioning as virtual regent long before Justin made him associate emperor on April 1, 527. Four months later, upon Justin I's death, Justinian became the sole sovereign at the mature age of 44. His administration had worldwide impact, constituting a distinct epoch in the history of the Byzantine Empire and the Orthodox Church. He was a man of unusual capacity for work (sometimes called the "Emperor Who Never Sleeps"), and possessed a temperate, affable, and lively character; but was also unscrupulous and crafty when it served him. He was the last emperor to attempt to restore the Roman Empire to the territories it enjoyed under Theodosius I.
Justinian viewed himself as the new Constantine. He believed in a Mediterranean-wide Christian order politically, religiously and economically, united and ruled from Constantinople under a single Christian emperor. To this end he directed his great wars and his colossal activity in reconquering the western provinces from the Germanic tribes. He surrounded himself with men and women of extraordinary talent, "new men" culled not from the aristocratic ranks, but those based on merit. In 523 he married Theodora, who was by profession a courtesan about 20 years his junior. He is said to have met her at a show where she and a trained goose performed Leda and the Swan, a play that managed to mock Greek mythology and Christian morality at the same time. Justinian would have, in earlier times, been unable to marry her because of her class, but his uncle Justin I had passed a law allowing intermarriage between social classes. Theodora would become very influential in the politics of the empire, and later emperors would follow Justinian's precedent and marry outside of the aristocratic class. The marriage was a source of scandal, but Theodora would prove to be very intelligent, "street smart," a good judge of character and Justinian's greatest supporter. Other talented individuals included Tribonian, his legal adviser; his finance ministers John the Cappadocian and Peter Barsymes, who managed to collect taxes more efficiently than any before thus funding Justinian's wars; and finally, his talented generals Belisarius and Narses. Theodora died in 548; Justinian outlived her for almost twenty years, and died on November 13, 565. He had no children and was succeeded by Justin II, the son of his sister Vigilantia, who was married to Sophia, the niece of Theodora. Justinian achieved lasting influence for his judicial reforms, notably the summation of all Roman law, something that had never been done before in the mass of unorganized Roman laws with no coherence. Justinian commissioned quaestor Tribonian to the task, and he issued the first draft of the Corpus Juris Civilis on April 7, 529 in three parts: Digesta (or Pandectae), Institutiones, and the Codex. The Corpus was in Latin, the traditional language of the Roman Empire, but which most citizens of the Eastern Empire poorly understood. The Authenticum or Novellae Constitutiones, a collection of new laws issued during Justinian's reign, later supplemented the Corpus. The Novellae appeared in Greek, the common language of the empire. Tribonian's law code ensured the survival of Roman Law; it would pass to the West in the twelfth century and become the basis of much European law code. It eventually passed to Eastern Europe where it appeared in Slavic editions, and it also passed on to Russia. It remains influential to this day. Like many of his predecessors in the Roman-Persian Wars, Justinian initially engaged in war against the Sassanid Empire. After this war had been concluded with an "Eternal Peace" in 532, Justinian turned the main focus of his military activities to the western Mediterranean Sea, where his armies, spearheaded by the general Belisarius, regained substantial parts of the territory of the former Western Roman Empire during the next twenty years. Belisarius had played a key role in putting down the Nika riots in Constantinople in January of 532, in which chariot racing fanatics had forced Justinian to dismiss the unpopular Tribonian and two of his other ministers, and had then attempted to overthrow Justinian himself. While the crowd was rioting in the streets, Justinian considered fleeing the capital, but he remained in the city on the advice of Theodora. Shortly thereafter he had the rebellion bloodily crushed by his generals Belisarius and Mundus. With the Nika riot put down and the Persians no longer a threat, Justinian turned his attention to the West. In 533-534, Belisarius reconquered North Africa from the Vandals after the Battle of Ad Decimum, near Carthage, putting an end to the short-lived Vandal Kingdom. Belisarius then advanced into Sicily and Italy, recapturing Rome (536) and the Ostrogoth capital Ravenna (540) in what has become known as the Gothic War. Then, facing renewed attacks by the Persians, who had plundered Antioch in early 540, and unhappy with his general’s somewhat independent course in Italy, Justinian dispatched him to the East. The war with the Persians, which concentrated chiefly on Armenia, went on for some years, with neither of the parties gaining the upper hand. When in 545 a new peace was established, the war continued in Lazica, which king Khosrau I sought to control. Generally, the Romans fared better than the Persians in this war, and in 562 a treaty was concluded in which the Persians agreed to evacuate Lazica. While the main military efforts of the empire were being directed to the East, the Ostrogoths had reconquered most of Italy, including Rome. Belisarius, who had returned to Italy in 544 but had been starved of troops, was relieved and called back to Constantinople. He defeated the Bulgars several years afterwards, when they appeared on the Danube for the first time in 559. Another general, Narses, assumed the command with fresh troops. In 552 the resistance of the Ostrogoths was finally broken. Meanwhile, Byzantine forces had conquered part of southern Spain from the Visigoths (551). Large parts of the conquests in the West would be lost again soon after the emperor’s death; nevertheless, under Justinian, the empire's territory had expanded greatly, if only for a short time. Perhaps the most noteworthy event occurred in 529 when the Platonic Academy of Athens was placed under state control by order of Justinian, effectively strangling this training-school for Hellenism. Paganism was actively suppressed. In Asia Minor alone, John of Ephesus claimed to have converted 70,000 pagans (cf. F. Nau, in Revue de l'orient chretien, ii., 1897, 482). Other peoples also accepted Christianity: the Heruli (Procopius, Bellum Gothicum, ii. 14; Evagrius, Hist. eccl., iv. 20), the Huns dwelling near the Don River (Procopius, iv. 4; Evagrius, iv. 23), the Abasgi (Procopius, iv. 3; Evagrius, iv. 22) and the Tzani (Procopius, Bellum Persicum, i. 15) in Caucasia. The worship of Amun at Augila in the Libyan desert (Procopius, De Aedificiis, vi. 2) was abolished; and so were the remnants of the worship of Isis on the island of Philae, at the first cataract of the Nile (Procopius, Bellum Persicum, i. 19). The Presbyter Julian (DCB, iii. 482) and the bishop Longinus (John of Ephesus, Hist. eccl., iv. 5 sqq.) conducted a mission among the Nabataeans, and Justinian attempted to strengthen Christianity in Yemen by despatching an ecclesiastic of Egypt (Procopius, Bellum Persicum, i. 20; Malalas, edited by Barthold Georg Niebuhr, Bonn, 1831, pp. 433 sqq.). The Jews, too, had to suffer; for not only did the authorities restrict their civil rights (Cod., I., v. 12), and threaten their religious privileges (Procopius, Historia Arcana, 28); but the emperor interfered in the internal affairs of the synagogue (Nov., cxlvi., Feb. 8, 553), and forbade, for instance, the use of the Hebrew language in divine worship. The recalcitrant were menaced with corporal penalties, exile, and loss of property. The Jews at Borium, not far from Syrtis Major, who resisted Belisarius in his Vandal campaign, had to embrace Christianity and their synagogue became a church (Procopius, De Aedificiis, vi. 2). At the very beginning of his reign, he deemed it proper to promulgate by law the Church's belief in the trinity and the incarnation; and to threaten all heretics with the appropriate penalties (Cod., I., i. 5); whereas he subsequently declared that he designed to deprive all disturbers of orthodoxy of the opportunity for such offense by due process of law (MPG, lxxxvi. 1, p. 993). He made the Nicaeno-Constantinopolitan creed the sole symbol of the Church (Cod., I., i. 7), and accorded legal force to the canons of the four ecumenical councils (Novellae, cxxxi.). The bishops in attendance at the Second Council of Constantinople in 553 recognized that nothing could be done in the church contrary to the emperor's will and command (Mansi, Concilia, viii. 970B); while, on his side, the emperor, in the case of the Patriarch Anthimus, reinforced the ban of the church with temporal proscription (Novellae, xlii). Justinian protected the purity of the church by suppressing heretics. He neglected no opportunity for securing the rights of the church and clergy, for protecting and extending monasticism. Although the despotic character of his measures is contrary to modern sensibilities, he was indeed a "nursing father" of the church. Both the Codex and the Novellae contain many enactments regarding donations, foundations, and the administration of ecclesiastical property; election and rights of bishops, priests and abbots; monastic life, residential obligations of the clergy, conduct of divine service, episcopal jurisdiction, etc. Justinian also rebuilt the Church of Hagia Sophia, the original site having been destroyed during the Nika riots. The new Hagia Sophia, with its numerous chapels and shrines, gilded octagonal dome, and mosaics, became the centre and most visible monument of Eastern Orthodoxy in Constantinople. From the middle of the fifth century onward increasingly arduous tasks confronted the emperors of the East in ecclesiastical matters. For one thing, the radicals on all sides felt themselves constantly repelled by the creed adopted by the Council of Chalcedon to defend the biblical doctrine of the nature of Christ and bridge the gap between the dogmatic parties. The letter of Pope Leo I to Flavian of Constantinople was widely considered in the East as the work of Satan; so that nobody cared to hear of the Church of Rome. The emperors, however, had a policy of preserving the unity between Constantinople and Rome; and this remained possible only if they did not swerve from the line defined at Chalcedon. In addition, the factions in the East which had become stirred up and disaffected because of Chalcedon needed restraining and pacifying. This problem proved the more difficult because, in the East, the dissenting groups exceeded supporters of Chalcedon both in numerical strength and in intellectual ability. Tension from the incompatibility of the two aims grew: whoever chose Rome and the West must renounce the East, and vice versa. 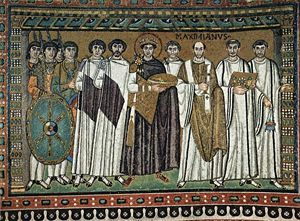 Justinian entered the arena of ecclesiastical statecraft shortly after his uncle's accession in 518, and put an end to the Monophysite schism that had prevailed between Rome and Byzantium since 483. The recognition of the Roman see as the highest ecclesiastical authority (cf. Novellae, cxxxi.) remained the cornerstone of his Western policy. Offensive as it was to many in the East, nonetheless Justinian felt himself entirely free to take a despotic stance toward the popes such as Silverius and Vigilius. While no compromise could ever be accepted by the dogmatic wing of the church, his sincere efforts at reconciliation gained him the approval of the major body of the church. A signal proof was his attitude in the Theopaschite controversy. At the outset he was of the opinion that the question turned on a quibble of words. By degrees, however, Justinian came to understand that the formula at issue not only appeared orthodox, but might also serve as a conciliatory measure toward the Monophysites, and he made a vain attempt to do this in the religious conference with the followers of Severus of Antioch, in 533. Again, Justinian moved toward compromise in the religious edict of March 15, 533 (Cod., L, i. 6), and congratulated himself that Pope John II admitted the orthodoxy of the imperial confession (Cod., I., i. 8). The serious blunder that he had made at the beginning by abetting a severe persecution of the Monophysite bishops and monks and thereby embittering the population of vast regions and provinces, he remedied eventually. His constant aim now remained to win over the Monophysites, yet not to surrender the Chalcedonian faith. For many at court, he did not go far enough: Theodora especially would have rejoiced to see the Monophysites favored unreservedly. Justinian, however, felt restrained by the complications that would have ensued with the West. But in the condemnation of the Three Chapters Justinian tried to satisfy both the East and the West, but succeeded in satisfying neither. Although the pope assented to the condemnation, the West believed that the emperor had acted contrary to the decrees of Chalcedon. Though many delegates emerged in the East subservient to Justinian, many, especially the Monophysites, remained unsatisfied; all the more bitter for him because during his last years he took an even greater interest in theological matters. ↑ See Michael Maas (ed. ), The Cambridge Companion to the Age of Justinian (Cambridge: Cambridge University Press, 2005, ISBN 9780521520713), pp. 355-356. ↑ Justinian publicly declared this on November 13, 535. Brownworth, Lars. 12 Byzantine Rulers: The History of the Byzantine Empire. This page was last modified on 15 June 2018, at 16:18.